Problem: Your XKLoader2 is not detected or its driver (Silicon Laboratories) is not installed. Unplug and replug the USB Wire of the XKloader2 to the USB Port of the computer to force the computer to detect the hardware in case it was plugged-in during the installation. Check that your XKloader2 USB Wire is connected to the computer. If the USB Wire is not connected straight to a USB Port on the computer (like if it is connected to a USB Hub , screen, keyboard), try to connect the USB Wire directly to the computer since that USB Port on the computer may be defective. Try another USB Port on the computer since that port may be defective. Try another USB Wire since it may be defective. Confirm the driver exists by going into Start..Control Panel..Add/Remove Programs (windows xp) or Programs and Features (windows vista/7). Look for Silicon Laboratories CP210x VCP Drivers (Show me..) . If you cannot find it in the list try to run the XpressVIP 4.5 installer, it should detect the driver is needed and re-install it . Problem: XpressVIP 4.5 is not detected. Check if you see a yellow bar at the top or the bottom of Internet Explorer that says 'Add-ons are currently disabled', if you see this you need to close this Internet Explorer and open the Internet Explorer that allows add-ons. Check if you have Google Chrome Frame installed, if you do you could uninstall it so that XpressVIP 4.5 add-on can run. Google Chrome Frame is an add-on for Internet Explorer which emulates Google Chrome engine in Internet Explorer, the drawback of this add-on is that it will prevent other add-ons from functioning. Problem: The interface (i.e. DB-ALL) is not detected. Check the D2D cable connects the interface to the XKloader2. Check that the D2D cable has the same pin-outs/wire colors on both sides making sure the wires are not crossed or miss pinned both plugs should look identical. Check that you are using an XKloader2 for newer products like DBALL, CANMAX400, 4X10, 5X10 since they cannot work with the older model XKloaders. For XK09: Check that the D2D cable is connected to the white port of the XK09 instead of the black port. Try another D2D cable , it possible the D2D cable is defective, or the pin may be damaged, bent, pushed-in on the cable, XKloader2 and interface. If you have another interface try it to see if it will detect. Close all Internet Explorer tabs and windows and reopen Directechs.com. 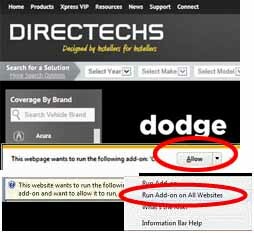 Sometimes the interface will not detect if you previously unplugged the USB Wire while you were in Directechs.com leading to the COMM port locking up. Problem : XpressVIP 4.5 is not detected. Problem : Your XKloader2 is not detected. Problem : Your interface is not detected. Problem : Your browser is not Internet Explorer. Is logged in and status? Note: It may take 24-48 hours for Technical Support to respond once your report has been sent.